Christian Ihle Hadland is widely recognized as one of Norway’s most exciting young piano talents and following his recital debut at the Norwegian Opera in 2008 was hailed in the Norwegian press as an artist who ..’shows himself as a unique musician whose artistry should be heard on the world’s concert stages’. 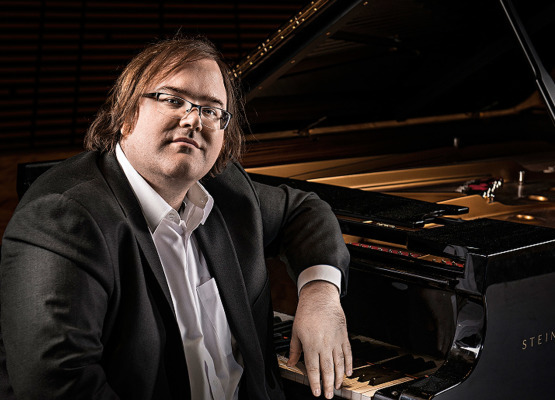 Christian Ihle Hadland was born in Stavanger in 1983 and received his first piano lessons at the age of eight. At the age of eleven he was enrolled at the Rogaland Music Conservatory, and in 1999 began lessons with Professor Jiri Hlinka, both privately and at the Barratt Due Institute of Music in Oslo. Christian made his Norwegian debut with the Norwegian Radio Orchestra at the age of 15, and has since gone on to perform with all of Norway’s leading orchestras, with annual appearances with the Oslo Philharmonic Orchestra. Recent and future appearances include concerts with the Swedish Radio Orchestra, Stockholm Philharmonic Orchestra, the Danish Radio Orchestra, NDR Hannover, Helsinki Philharmonic and Swedish Chamber Orchestra. He was appointed a BBC New Generation Artist in 2011 and since has worked with all of the BBC orchestras as well as several chamber and recital projects. In February 2013 he toured the UK with the Bergen Philharmonic Orchestra performing Grieg and Beethoven to great critical success and later the same season he performed the Beethoven Piano Concerto No 2 with the Oslo Philharmonic Orchestra / Vassily Petrenko at the BBC Proms in Royal Albert Hall. In October the same year he made his US debut with the Seattle Symphony Orchestra. Christian is already highly sought-after both in recital and as a chamber musician and has appeared several times in prestigious venues and festivals such as Wigmore Hall, Risør Chamber Music Festival, the Schleswig Holstein Music Festival, Cheltenham and Bath Festivals and Kissinger Sommer. He made his debut at the Bergen International Festival in 2004 and has since appeared as both with orchestra, as a solo recitalist and in chamber groups. In 2011 he performed the Grieg Piano Concerto as part of the Festival´s 50th Anniversary celebrations with the Bergen Philharmonic Orchestra. He has collaborated in chamber music with such prestigious artists as Henning Kraggerud, Lars Anders Tomter, Steven Isserlis, Tabea Zimmermann, Clemens Hagen, Christian Poltera and Truls Mørk. In 2009 Christian was appointed joint Artistic Director of the Stavanger Chamber Music Festival alongside Swedish clarinetist Martin Fröst. In 2013 he made his chamber music debut at the Proms with the Signum Quartet at Cadogan Hall. Christian released his debut solo album in April 2010 for Simax Classics. This recording of works by Chopin and Schumann in their 200th anniversary year attracted great deal of interest with positive reviews across the board. This recording follows on from the highly successful recording partnership between Christian and Henning Kraggerud where they recorded working by Norwegian composer Christian Sinding for Naxos label. Christian also collaborated with singer, Isa Katharina Gericke in 2009 to produce recording of Eva Nansen’s work, also for Simax Classics called “Til Eva”. In January 2013 his recording for Simax Classics of Mozart Piano Concertos with the Oslo Philharmonic Orchestra / Arvid Engegård was released. The following year this recording was nominated for the Spellemann Prize, the Norwegian equivalent of the Grammys.